In a large saucepan combine water and Baked Potato Soup Mix over medium high heat. Whisk until mix is dissolved. Continue to stir frequently. Bring to a boil; then reduce heat to simmer. Add crumbled bacon and spinach. Continue to cook for 20 minutes. 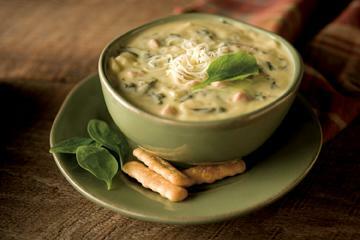 Serve hot and garnish each serving with shredded Swiss cheese. Option: Substitute 1 1/2 cups cubed cooked ham instead of bacon.